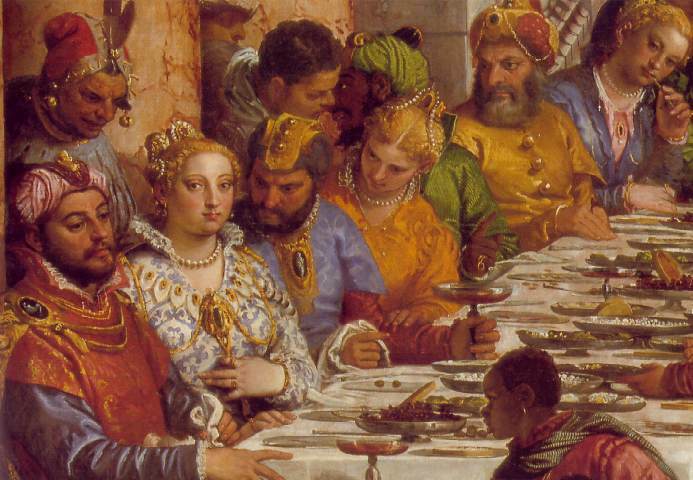 The sumptuous, vivid painting of the wedding at Cana, by Paolo Veronese, is a gigantic canvas measuring about 21ft. tall by 32 ft. wide. The masterpiece has unfortunately suffered several indignities in its life. Now in the Louvre, it was originally painted for the Benedictine Monastery of San Giorgio Maggiore in Venice in 1563, but Napoleon’s army carried it off to Paris as spoils in 1797, cutting it in half in the process. 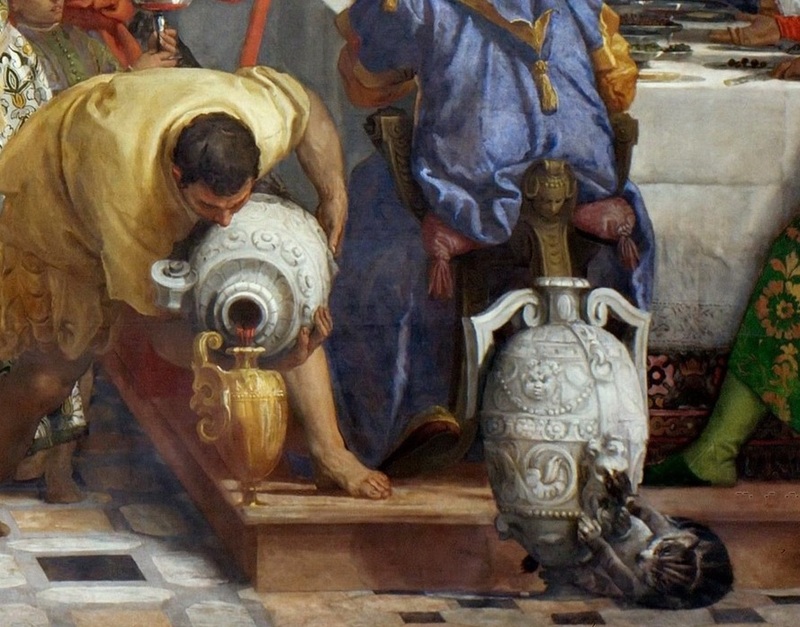 During WWII it was rolled up and carted around France, along with other Louvre treasures, to keep it out of Nazi hands. Then, in 1992, it was severely damaged during conservation, when the support rigging holding the one and a half ton painting gave way and tore through the canvas in several places. Jesus stares directly out at us at the center of the scene with his mother Mary beside him, both adorned by halos. This spot at the banquet table would normally be reserved for the bride and groom, but the placement of Jesus here emphasizes the painting’s religious nature. In Christian theology, Jesus is the bridegroom and the Church is his bride. On the terrace above Jesus an animal is being butchered, which art historians believe to be a lamb since that would provide the symbolism of Jesus as the lamb of God who takes away the sin of the world. Confirming this is the knife poised directly above the head of Christ. 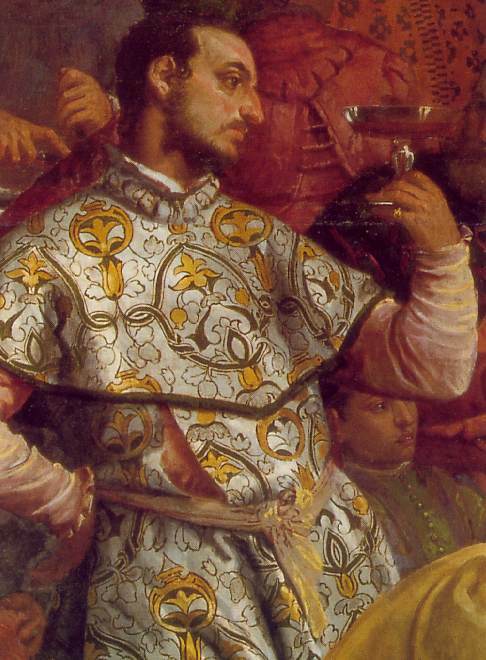 The crowd of attendees are clothed in luxurious Renaissance attire for the wedding, and Veronese made full use of his expressive Venetian palette in the brightly colored apparel. His contract specified the size of the painting and the number of figures, as well as the most expensive imported pigments, such as lapis lazuli from Afghanistan for the blue hues. 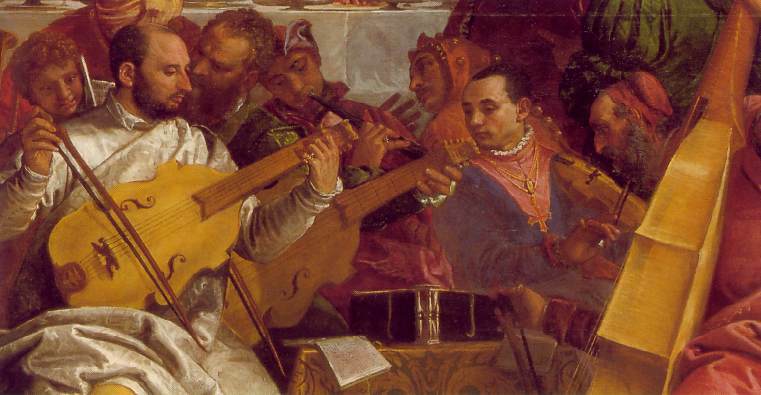 The musicians play Renaissance instruments, and it’s thought that Veronese painted portraits of Venetian artists of the time in this role, including himself as the viola player at the front. A splendidly-attired man prepares to taste the wine that Jesus’ miracle has produced. The red wine is visible in the beautifully reflective glass, a nod to the glass manufacturing for which Venice is still known today. The wine symbolizes the blood of Christ which was shed for us and which we share at communion. The wine is the new wine of the gospel. Just as Jesus turns water into wine at the wedding in Cana, the bread and wine are miraculously transformed into the body and blood of Christ at Mass. As I consider this painting and the story from the Gospel of John, I’m struck by the phrase, “his disciples began to believe in him.” We can see several men seated near Jesus at the banquet table. 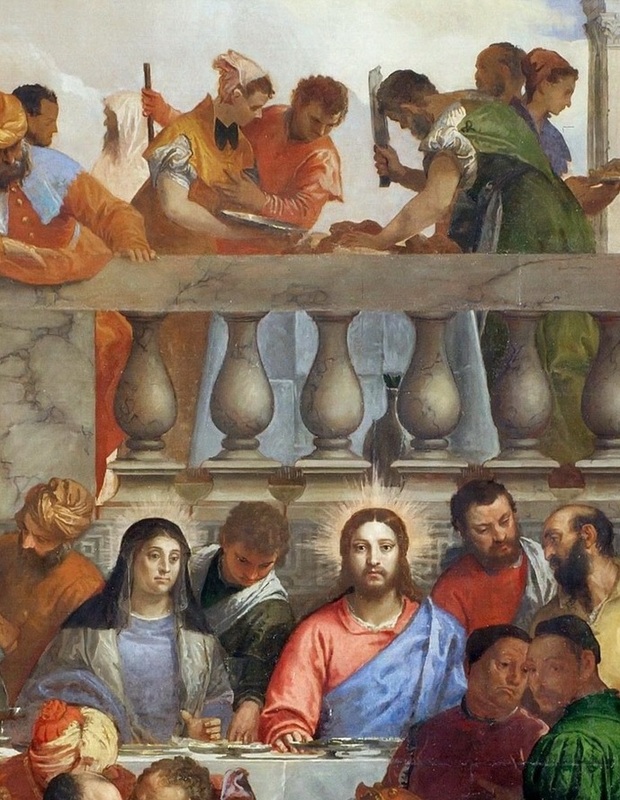 Plainly dressed, they are the only figures who are staring directly at Jesus, while everyone else in the painting seems oblivious to him and to the miracle that has occurred. These men, staring at Jesus intently, questioningly, are obviously the disciples, though their individual identities are uncertain. Imagine that you are one of them. This man Jesus whom you are following speaks like a wise teacher, though much of what he says goes over your head. Now, unexpectedly, he has done this impossible thing. You are suddenly seeing him in a new way. In the center of the painting, Christ sits radiantly haloed and luminous. His glory is revealed! Do you now believe? How will you respond to Mary’s command, “Do whatever he tells you”? Spend a few moments imagining yourself in this scene, realizing for the first time that your leader is something more than just a wise man. 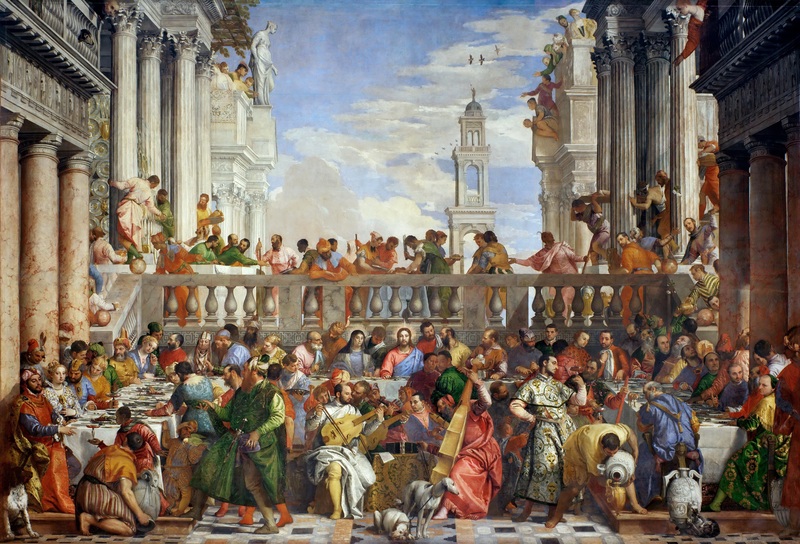 Here is a link and a fascinating video with information on the Factum Arte project, the creation of a digital replica of the Wedding at Cana, which was placed in the painting’s original location at San Giorgio Maggiore in Venice. This project of duplicating artworks is not without controversy though, as this New York Times article indicates. What is your opinion? 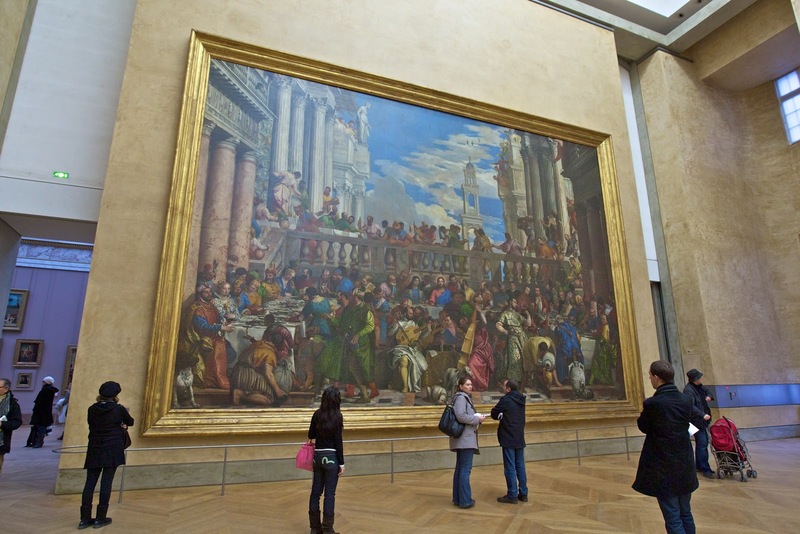 This entry was posted in Art, Bible and tagged Factum Arte, Louvre, Renaissance, Venice, Veronese, Wedding at Cana. A) now this is what a wedding setting should look like!